Do your presentations need a "facelift"? Start with the basics of visual communication and storytelling. Presentations have become the de facto business communication tool. Companies are started, products are launched, audiences are educated—in small or large part because of the quality of presentations. Likewise, ideas, endeavors and even careers can be cut short due to ineffective communication. Out of the millions of presentations delivered each day, only a small percentage are delivered really well. The reason for this is many of us lack visual communication skills. Most of us were never taught how to move from verbal expression to visual expression (or have ever taken a PowerPoint training course). As communicators, learning to create visual stories that connect with our audience is imperative. Turning category management data and analytics into a compelling PowerPoint presentation that engages an audience starts with the basics—you need to give equal attention to developing the visual story and to delivering the parts of the presentation! The opportunity? 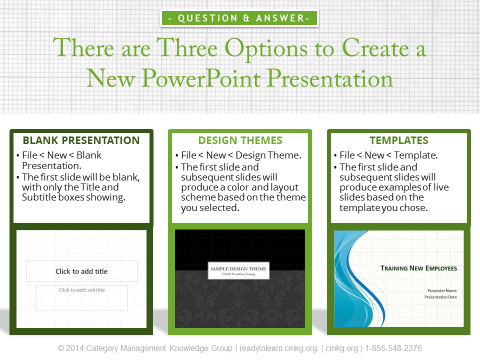 Start with the basics about how to use PowerPoint and create logic and flow for your slides. Once you develop your visual communication and storytelling skills, you can start learning where and how to add the data and insights into your presentations to create persuasive fact-based sales presentations. By following the 4 steps below, you will become proficient at taking data and insights and turning them into a compelling story that will engage and inform your audience, making it easier for them to say yes to your idea. 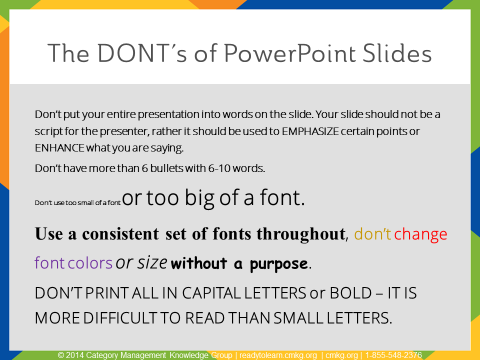 Have you ever felt frustrated and like you are wasting time in PowerPoint by having to format and re-format your slide? There’s help. Introducing design themes, templates and SlideMasters, which are the building blocks of PowerPoint—they allow you to create a base from which all of the slides are derived within a presentation. If you don’t know how to use these functions in PowerPoint, chances are you may be wasting time. Constantly change the size of the text boxes OR bullet types on each slide. Adding SmartArt graphics—including hierarchies, lists, processes—to turn bullet points into a more visually appealing diagram. You can save a lot of time and frustration by understanding which option is the best for you (and how to most effectively do it) before you create your presentation! First, you need to identify the characteristics, knowledge and needs of your audience so that you are delivering the ‘right’ presentation to the ‘right’ audience. Know who your audience is, what they want/need to know and what their background is (academic and otherwise). Defining your audience is the best way to consider the design, structure and delivery of your presentation. Structure is important because a well organized presentation creates an impression that you know what you are talking about. You will gain the audience's trust and they will be more likely to listen to you. What are the main points I want my audience to take away from my presentation? To what level do I want them to understand or to know my main points? Are there any actions that I want them to take at the end of the presentation? By understanding your audience, and then defining the purpose or objectives of your presentation, you now have a strong foundation from which to build the flow. The rest of your presentation should stick to the purpose that you've defined. Keep reminding yourself of the purpose as you develop your presentation—it will help to keep you “on track”. Inappropriate presentation graphics tend to distract audiences and leave them to resolve visual disparities and inconsistencies in their own minds. And using no graphics will leave your audience bored and less engaged—your job is to find the balance. Your content may be incredible—with insights and recommendations that are game-changing. But if you don’t present it with flow (which I covered above), and also in a visually engaging way, your audience may not see and hear the story you are telling. Remember, consistency is key—keep the same fonts and colors throughout your slides. You also want to make sure you use the right charts. Pie charts work only for showing large differences in proportion, especially percentages. Bar charts are visually more precise than pie charts. Improving your CatMan presentation skills can take your presentations from good to great! Remember that the visual is important—no matter how great your content is (whether it's a category management presentation, a business review or a new product launch), if your presentation lacks visual appeal and/or does not have the right logic and flow, you haven't done everything you could to persuade your audience. 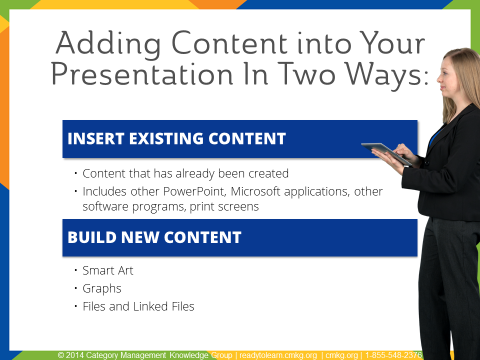 Looking for more information on building your PowerPoint and presentation skills? Category Management Knowledge Group can help you, your team or your organization learn more through a single course or a customized program. We have some great category management training options available to meet your needs. Check out our accredited course on “Building PowerPoint and Presentation Skills” where you can watch a video preview of the course.